Expect a Belcher behind the counter Sunday — and free burgers to the first 1,000 fans. The burgery magic of Bob's Burgers is coming to Hi-Pointe Drive-In (1033 McCausland Avenue, 314-349-2720) this weekend, just in time to commemorate the Fox sitcom's 150th episode chronicling the good-natured-but-deeply-dysfunctional Belcher family. 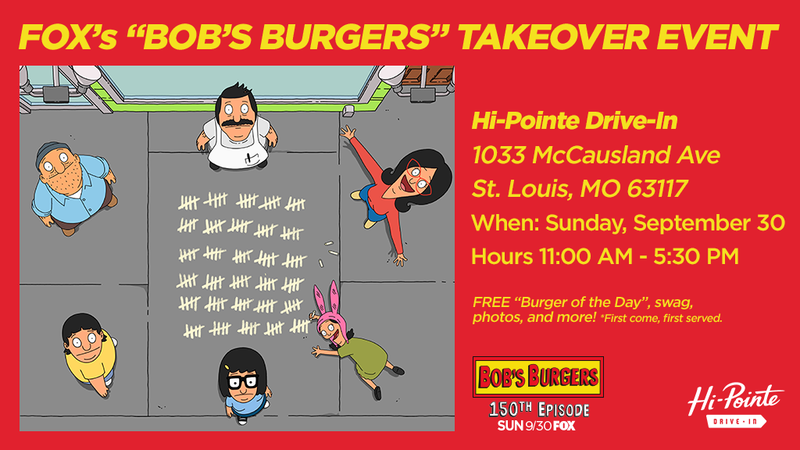 Granted, you probably won't see Bob flipping burgers or Tina touching buns over at Hi-Pointe, but on Sunday, September 30, from 11 a.m. to 5:30 p.m., 1,000 fans will snag a free “Burger of the Day” inspired by the show, including drinks and fries. Now, we would have been happy with the "Onion-tended Consequences Burger" or "Bohemian Radishy Burger" .... anything as long as it wasn't the "Human Polenta-pede Burger." And Hi-Pointe says we're in luck: The day's special will be the “Don’t You Four Cheddar ‘Bout Me Burger.” All they're saying when it comes to details is that it involves no less than four types of cheddar. Can't argue with that. Fans seeking more details are encouraged to follow @BobsBurgersFOX and @HiPointeDriveIn for more info.